Issue #211: Mycroft – Can an open source personal assistant compete with Alexa? You can't get more sci fi than a little box that listens to your instructions and talks back. Most of the leading personal assistants come in very opaque little boxes, but the open source community is hard at work finding its own solutions. 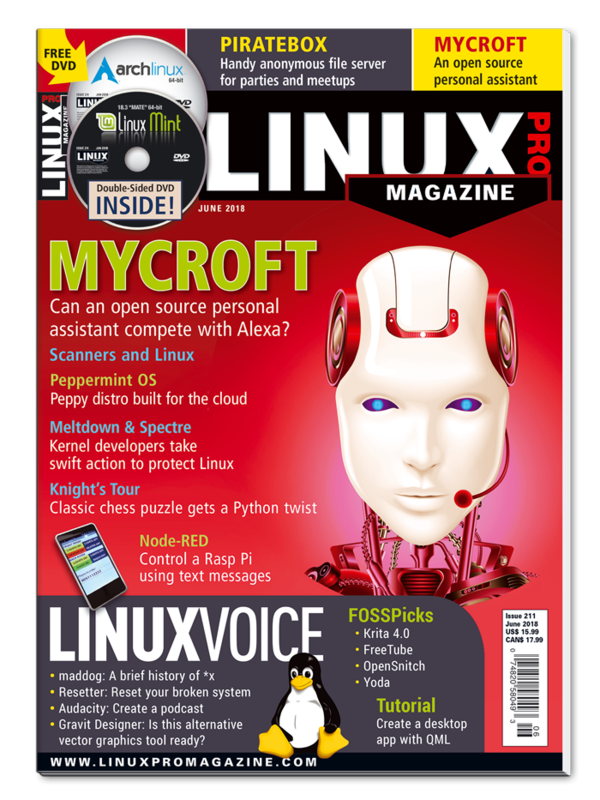 Mycroft is an open source assistant that comes on a hardware device, but you also can download the software and install it on a Linux system. * Meltdown and Spectre – These catastrophic hardware bugs have created problems for computer users around world. Find out what Linux developers are doing to clean up the mess. * Knight's Tour – Practice your skills with a Python solution to this classic chess puzzle. * Check out MakerSpace for a look at how to control your Raspberry Pi from an Android. * Visit LinuxVoice for a tutorial on writing apps with the Qt Modeling Language (QML). The first time in our lives we got to a black-and-white Linux or Unix shell, most of us probably typed ls first. In a mixture of nostalgia and the knowledge that life is colorful, columnist Charly K¸hnast plays a colorful trump card with colorls. We show you how to control devices connected to Rasp Pi GPIO pins with text messages from an Android phone. 62	Open Hardware – Keyboardio Hack Reprogramming the Keyboardio Model 01's firmware is limited only by its memory and your imagination. Fedora enters the IoT space with a lean new distro that features atomic updates. A digital audio recording with Audacity is a great way to deliver your message. Edit vector graphics with Gravit Designer and save the results in the SVG, PNG, and JPEG formats. QML makes writing desktop applications a breeze, and you can later compile them into standalone programs.